Meera Bhat is the director of North America Cities at The Nature Conservancy, where she oversees efforts to bring nature-based solutions to urban communities, natural systems and built environments. Her team works in a 24-city network across the country to advance conservation as essential component of healthy, just and resilient cities. Key aspects of her work include: working with local partners in low-income and vulnerable communities; creating tools for urban conservation practitioners that emphasize human well-being outcomes; and leveraging a diverse set of projects and partnerships in support of policy goals that put community well-being at the center of cities. 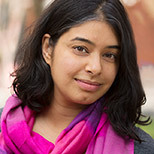 Since 2013, Meera has served on the board of the Brooklyn Queens Land Trust, an organization that holds and manages in perpetuity over five acres of land in New York City for community gardening. These 34 gardens, open to the public, primarily serve African American and immigrant communities in neighborhoods where access to open space is limited. She has been an advocate for urban agriculture and community access to vacant land in New York City since 2010, working with organizations such as Prospect Farm, Five Borough Farm and 596 Acres. Prior to her work at The Nature Conservancy, Meera worked at Columbia University’s Mailman School of Public Health as a program manager, researching the ecology of infectious diseases in diverse settings such as South America, Africa and the United States. She holds a BS in Mathematics and Cell and Molecular Biology from the University of Michigan and an MS in Computational Biology from New York University. She is currently pursuing an MS in Urban Planning from Columbia University.